I think I am geranium crazy this year. I love the look. 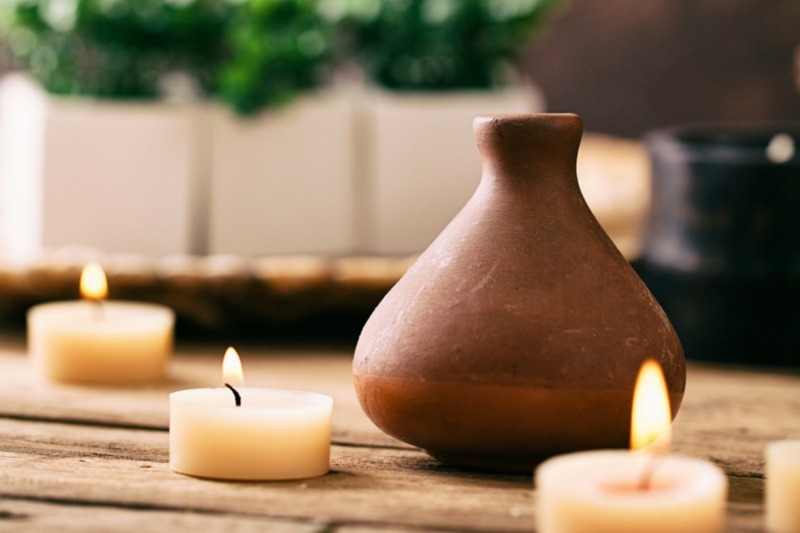 I had been using red geraniums. 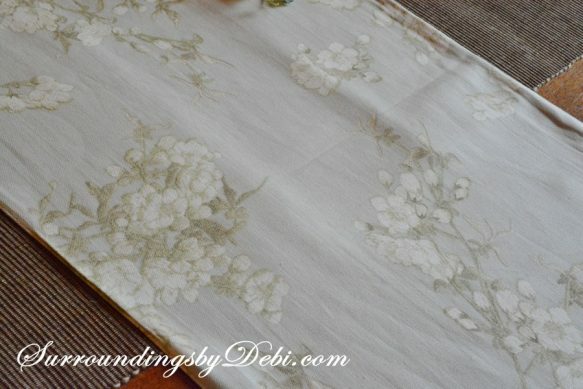 Now I have found white ones that go perfectly with a table runner I had recently purchased for a tablescape. 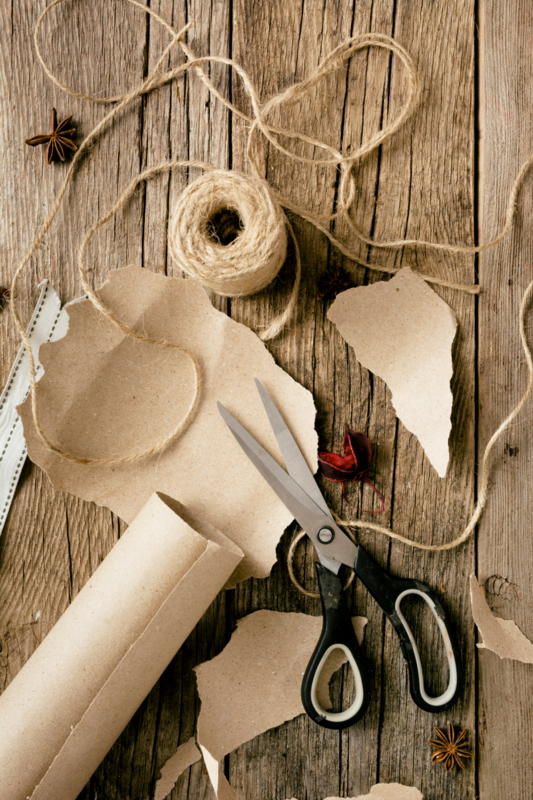 The best thing of all – they were only $2.39 on sale at JoAnn Fabrics. 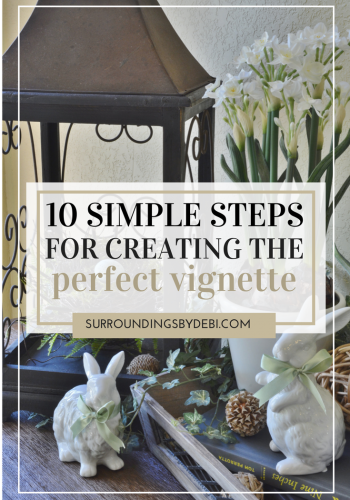 As I was running behind a bit – that’s nothing new here – I needed to create a simple and quick centerpiece. 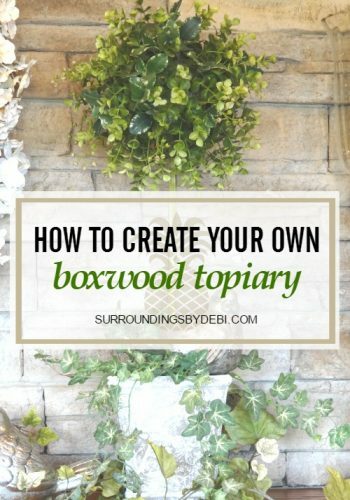 To do this, I simply used three of the white geranium bushes and “zip tied” them together. That’s right – nothing to it but simply zipping them together with zip ties. Now how easy is that? I laid two geranium bushes with the stems facing each other and pulled the tie around the stems securing them tightly. Once I had two tied together, I took a third bush and bent the stem so the top portion of the bush made a right angle to the first stems and zip tied the three together where they intersected. 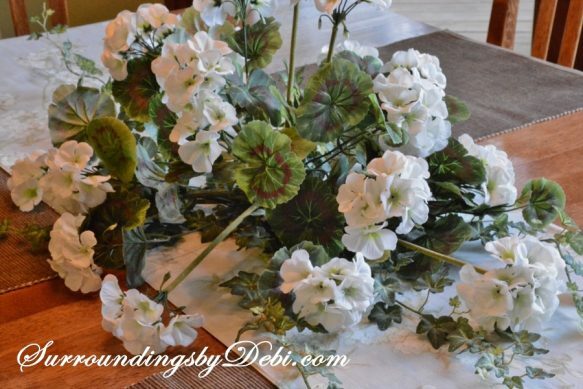 Then I simply pulled the stems on the geraniums apart to form the arrangement. 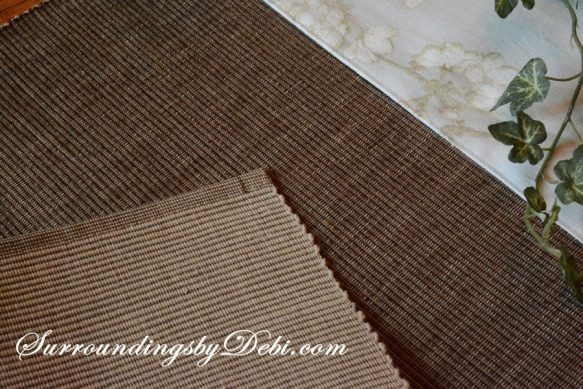 I began my table design by laying placemats lengthwise across my table to form a runner look. I did this across two sections of the table. I actually used the backside of the place mat. I had purchased these mats some time ago, but when I got them home I wasn’t as fond of the color as I thought I would be. I never did take them back – one of my bad habits. Do you ever do that? I have every intention of returning an item, but never get it done. When I rummaged through my assorted placemats, I came upon these. Even though I felt the top color was too washed out with the runner I was using, the backside seemed to pull out the deeper color in the runner so I chose it. 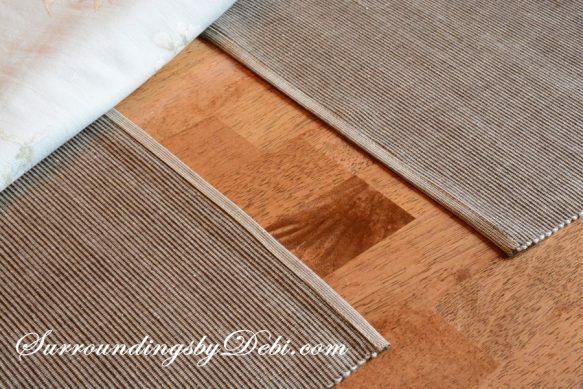 Once I had the placemats placed across the table to form the runner look, (they didn’t quite meet in the middle), the decorative runner was laid down the center of the table. 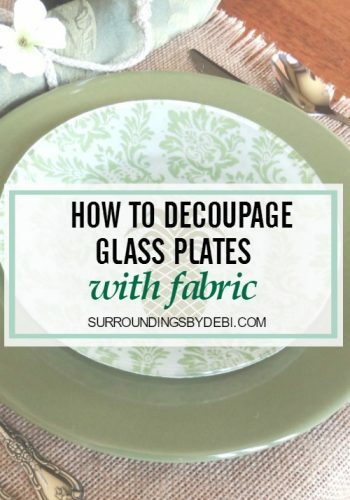 This covered the gap between the placemats and created a cohesive look. 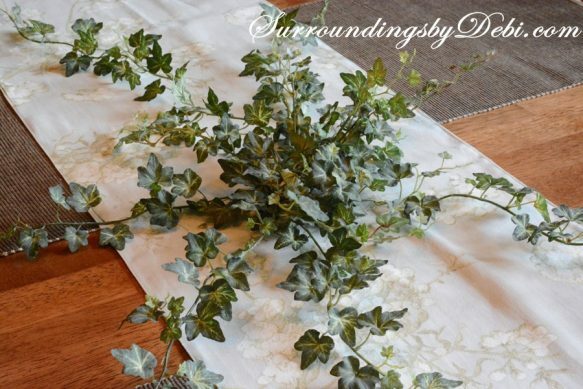 I then laid one of my “go to” ivy bushes in the center of the runner, spreading the tendrils to form a base for the geranium arrangement. I always keep these ivy bushes on hand – I am always finding a use for them when decorating. 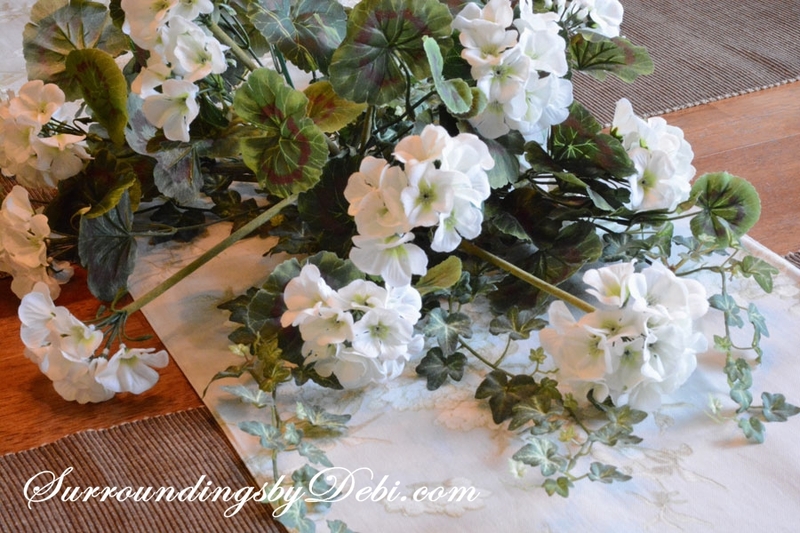 The geranium bush centerpiece was then set on top of the ivy. I worked a few of the center ivy tendrils into the geraniums. 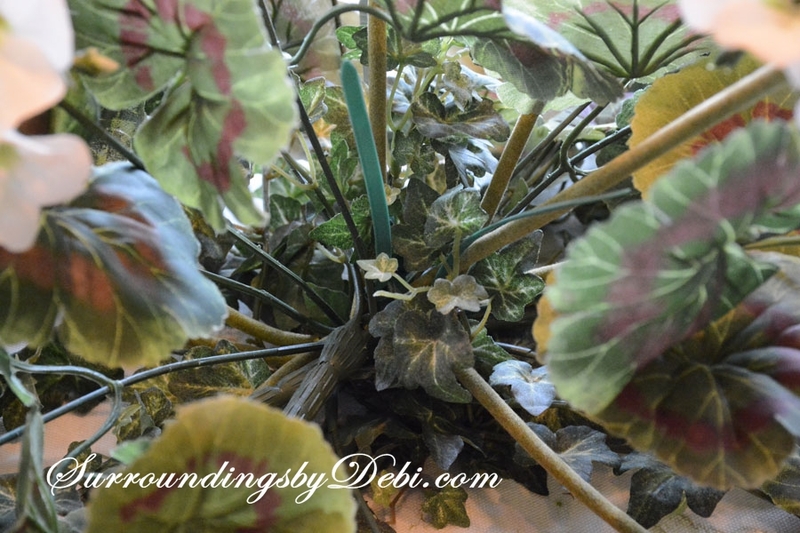 I left the zip ties on the geraniums to give you an idea of where they were placed. 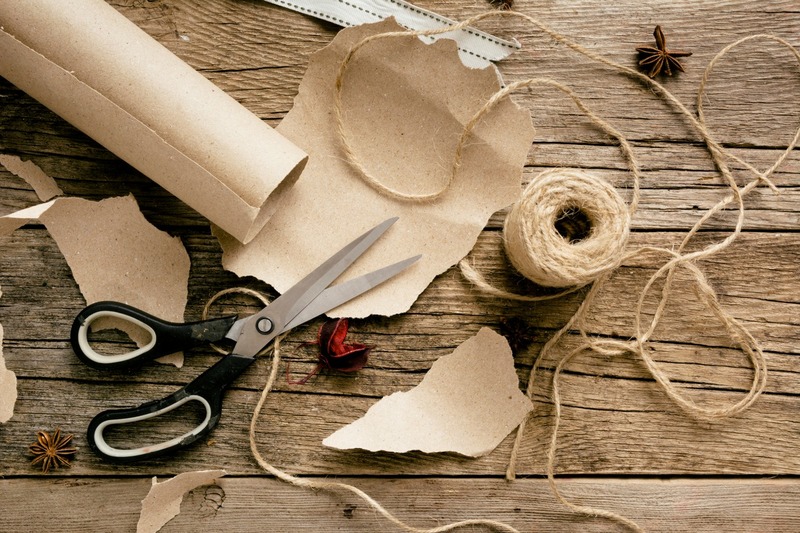 You would cut the ends shorter if they were visible. You can see this works great as a centerpiece. 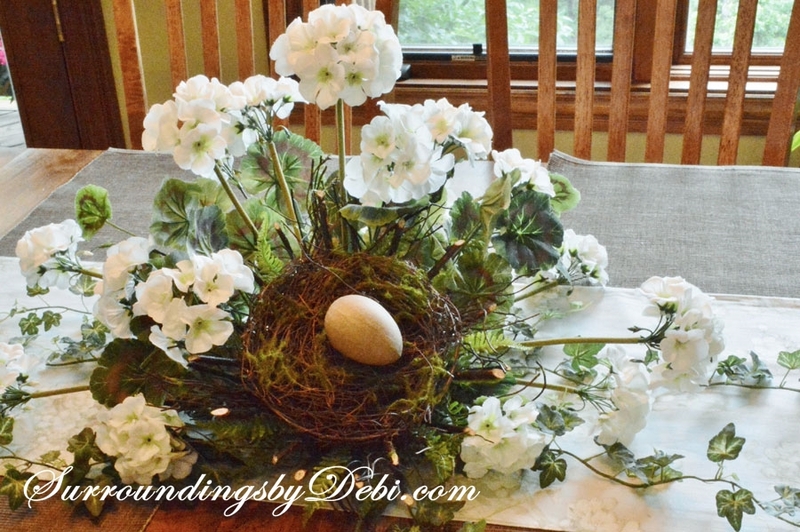 I wanted to add a bit of interest to the arrangement, and simply nestled a nest into the side of the arrangement, working the geraniums around the nest. 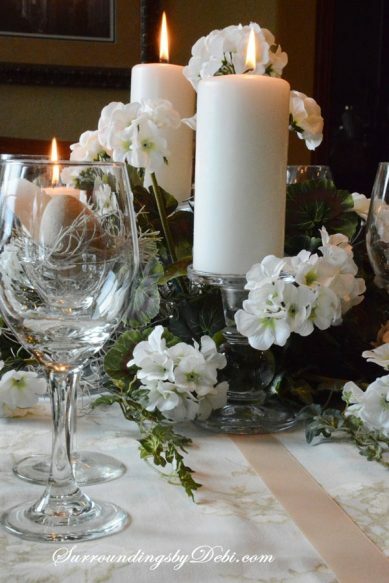 The place settings were added to the table. The white china was a recent garage sale find. I love the raised look on the edges. I found these cute little goblets at the same sale. 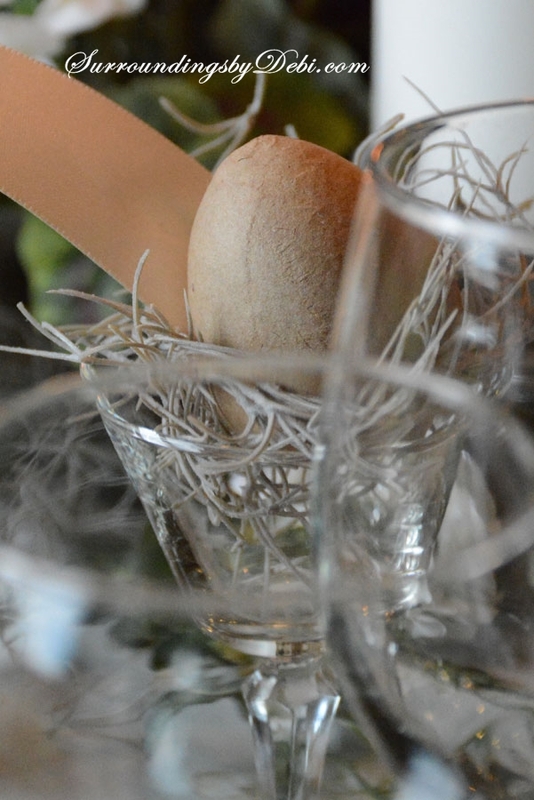 I added a bit of faux Spanish moss into each goblet and placed a paper Mache egg in the center. The eggs were a last year purchase from Hobby Lobby. I didn’t even add color to them – just used the eggs right out of the package. 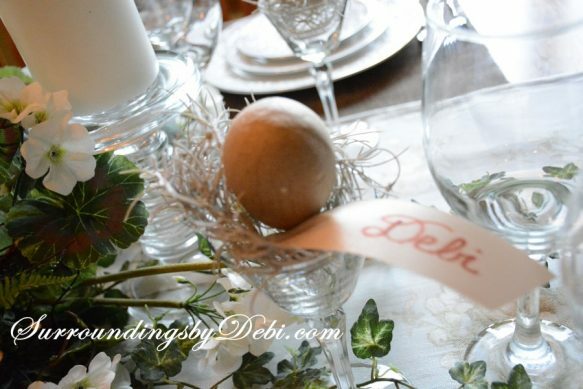 I tucked a bit of ribbon under the egg to use as a place card name. I quickly added my name to the ribbon. I am sure we could do better if they were for guests. Candles on glass candlesticks were placed on the table around the geranium centerpiece. To carry the color of the place card ribbons throughout the setting, I added ribbon streamers down the runners. I created small wreath napkin rings out of twig wire to hold the napkins. I loved the look of the candles with the geraniums. 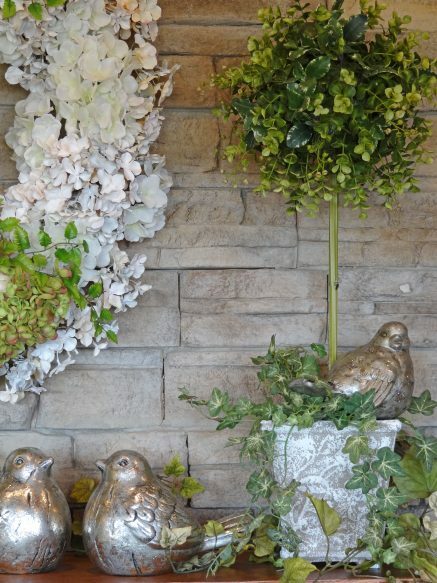 The whole look gave the feel of a merging of natural and classic. Thanks for taking time to visit today. 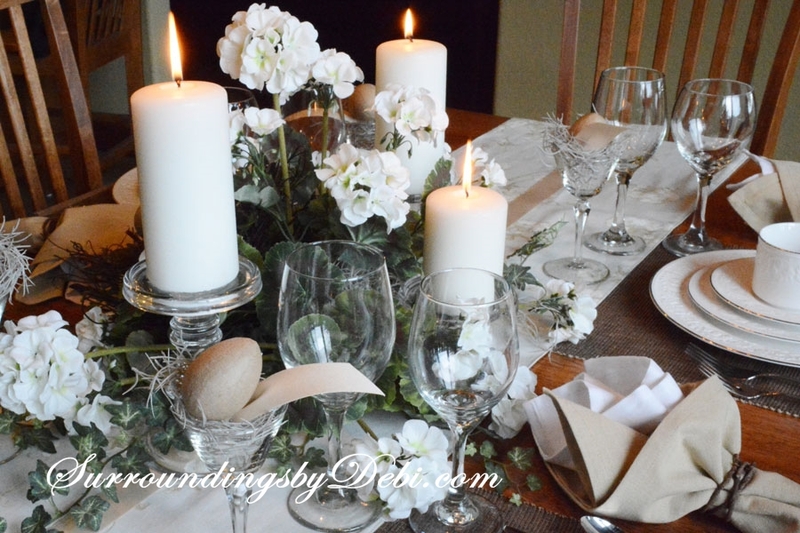 If you enjoyed this tablescape, take time to leave me a comment. 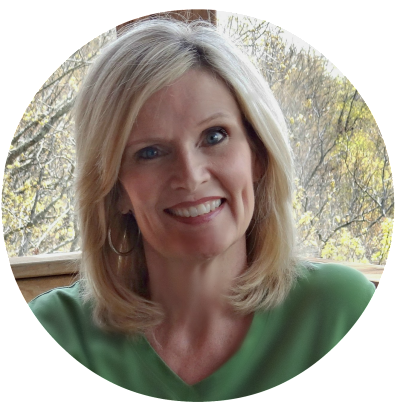 As a “newbie” to blogging, I am encouraged by your words. « I’m Late for the Party! Stunning table. Thank you for the assembly tips. I will use them. 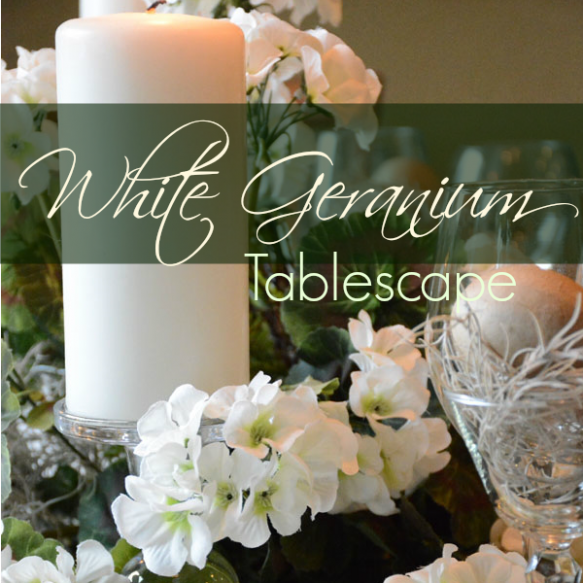 I remembered your Red Geranium tablescape and was intrigued to click on the pic of your white one at BNOTP – so glad I did! Love the peaceful serene look of the white and the way you’ve decorated the rest of the table. Can’t believe those dishes were a GS find! Lovely! Just stopped by your site. It is indeed very creative! Look forward to even more visits together! Very pretty! 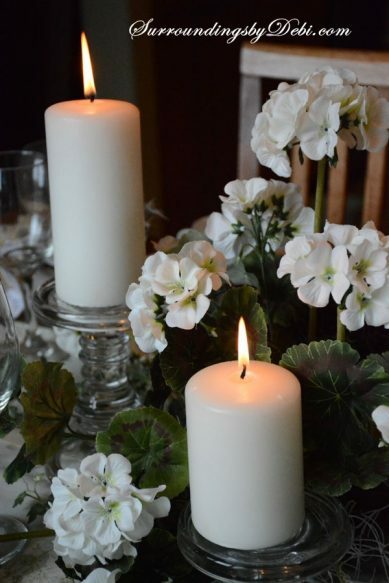 Love how the geraniums look with the white candles! You did an excellent job of creating a nice low-lying (high centerpieces are a pet peeve of mine!) centerpiece by gradually adding different items. I enjoyed my visit here from Swing into Spring party. Thanks DD! That’s one of my pet peeves as well. I always try to keep that in mind when setting a table. Thanks for stopping by! Hope to see you again! Lovely table, love all the white, so clean and fresh. Like how you used the zip things to attach the bushes together. I have done them like that but just kept working with them till they would lay right, that seems sooo much easier. Anniversary or you could incorporate just one colors too if you desired. You have a great day, nice to meet you hear in blogland. Thank you Nellie. I appreciate all of your wonderful comments. The china was a real find. I just popped over to you cute sight. I will be back for a visit. Hope you stop back here as well! 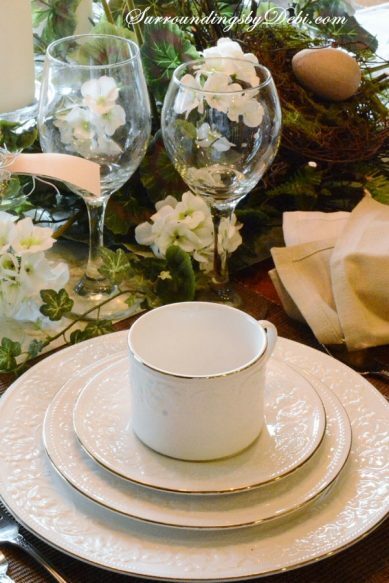 Love the way your centerpiece looks…perfect with your china! 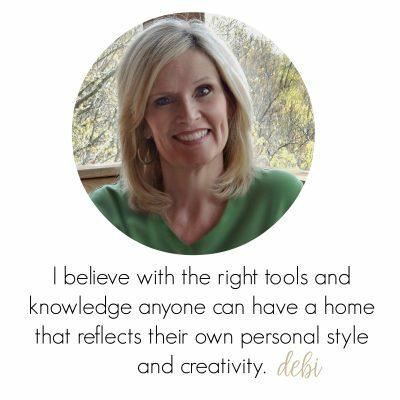 Thank you Bev! What a sweet blog you have as well! Please come back to visit again. 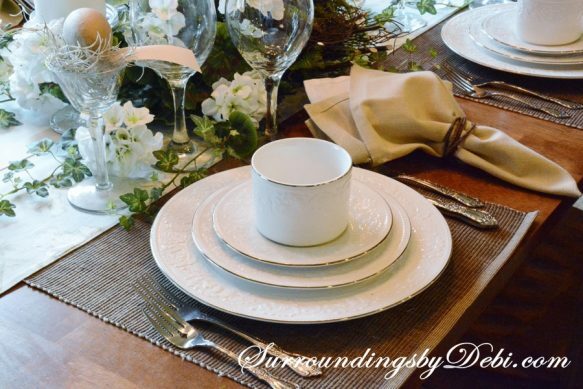 I hope we can share tablescapes again soon. Wow, when you set a table you really set a table! and you got a great find at the garage sale, those dishes are wonderful and I love your geranium centerpiece! Thank you Christine. I popped over to your site as well and I could say the same about your table! It was lovely. 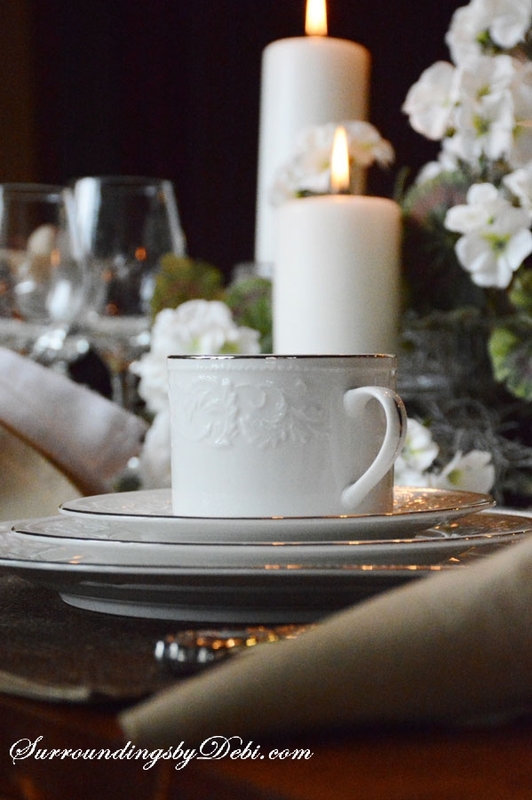 I do love the dishes – 8 place settings and serving pieces. I am sure they will be used frequently! Thank you for stopping by. 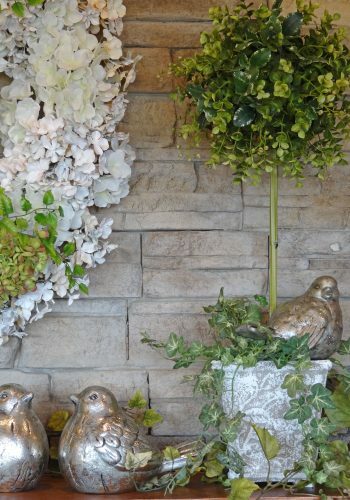 It sure shows in the details that you have 32 yrs of floral experience. 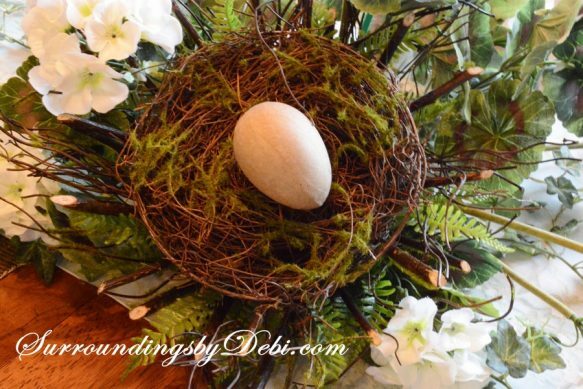 The eggs, moss and ribbon nesting in glass adds a lot of charm and texture. I love the simple cylinder shape of the coffee cup. Thank you so much Wanda for your nice compliments. I truly did love the floral and gift business. I am so happy to be sharing here and doing what I love to do. Hope you stop by often. 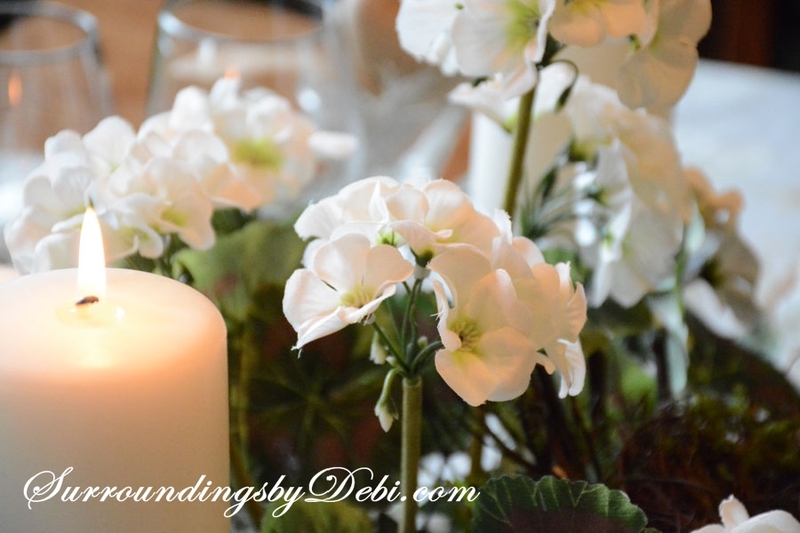 Hi Debi…love love your tablescape! Very elegant but loved the little touches of the nest and eggs. 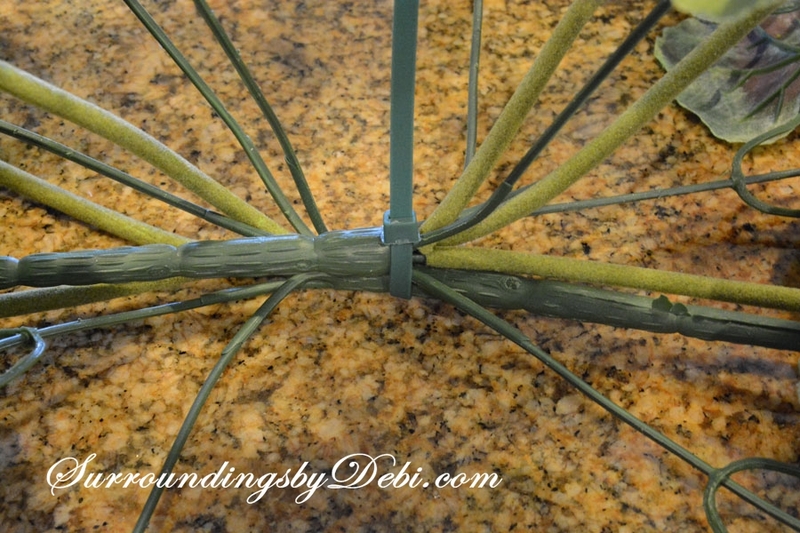 Very nice trick with the zip ties too:) You must come by and visit us…I would love to connect and stay in touch with you….we are newbie bloggers too at http://www.onlinesisterhood.com🙂 You should party at some of the same places I do…your tablescape is very lovely. found you this morning at imparting grace linky! Have a wonderful week. Thanks for stopping by. I was at JoAnn’s just a couple of days ago. They still had the white geraniums (and red ones too)! And best of all – they were still on sale. My post is about my dining room table. A little different. Check it out. I think you’ll like it. Thanks you for stopping by to visit. 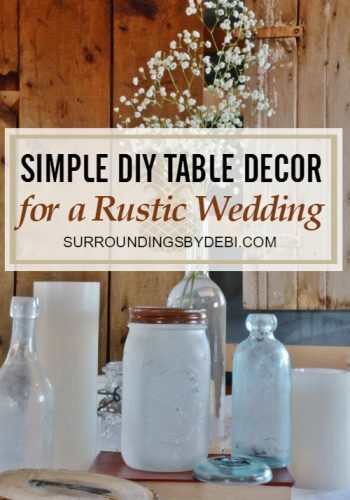 I took a hop over to your site and loved your dining room table post. You are certainly right our tables would have stories to tell. Sorry you had trouble logging into Facebook. I will have to check that out. 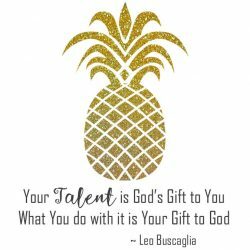 As I say I am a “newbie” at this blogging and am learning every day! Hope you stop by again.